Using rotisserie chicken and a store-bought alfredo sauce means that this comforting pasta dish bakes in 30 minutes—perfect for a warming weeknight dinner. 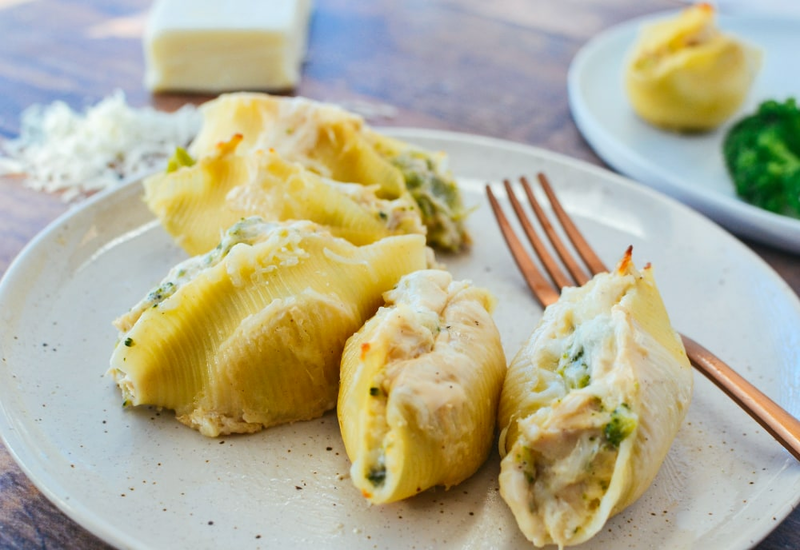 Shredded chicken and steamed broccoli florets provide a lighter twist on the classic stuffed shells, and the creamy sauce is sure to be a hit with kids and adults alike. You could also use the cheesy filling with manicotti. Alternatively, toss the chicken and broccoli mixture with cooked penne or farfalle, then sprinkle with cheese and broil for two to three minutes to melt mozzarella. Top with a little fresh basil if you like. For a healthier alternative to alfredo, use a prepared tomato sauce that's low in sugar. You could also use a mixture of half alfredo and half store-bought or homemade pesto for a super-flavorful yet creamy sauce. For an extra boost of iron, stir in two cups chopped fresh spinach to the chicken-broccoli mixture. Per Serving: 1242 calories; 50g fat; 138.7g carbohydrates; 57g protein; 165mg cholesterol; 955mg sodium. YUM! This was a really easy and delicious recipe. I didn't think anything this good could be 5 ingredients or less! This only has a ten minute prep time so it was a perfect dinner to make for the family after work, highly recommended! Loved these shells, they are really quick and simple. I can never eat just a couple, whenever I make them I keep going back for more. Make sure you cook the shells al dente so they hold up nicely as you stuff them. This recipe is so easy, even a beginner or teen could make this. This is perfect for busy weeknights. I grabbed a rotisserie from the store, and was able to make this in under an hour. The kids also love to eat this as finger foods. I'm just happy they're not complaining about eating broccoli. That's what I call a win! Not a fan of Alfredo sauce so I used a tomato sauce instead and it was really good. I also used some leftover shredded chicken I had in my fridge. Such a great way to eliminate food waste. This was really good!!! We purchased the Costco rotisserie, so we will also have leftover chicken for others meals and salads throughout the week. Highly recommend this recipe. Took a little bit longer to prep, but great for a Sunday.